Every organization today expects to use the power of AI to increase productivity and drive business success. We’d all like to use advances in Machine Learning to predict business outcomes that influence our success in our roles, and that are specific to our part of the business process. Classically, organizations either employ data scientists to build custom ML models for each outcome, or purchase off-the-shelf products that are specific to each task. Last week, we announced the Preview Refresh for Dynamics 365 for Customer Insights. 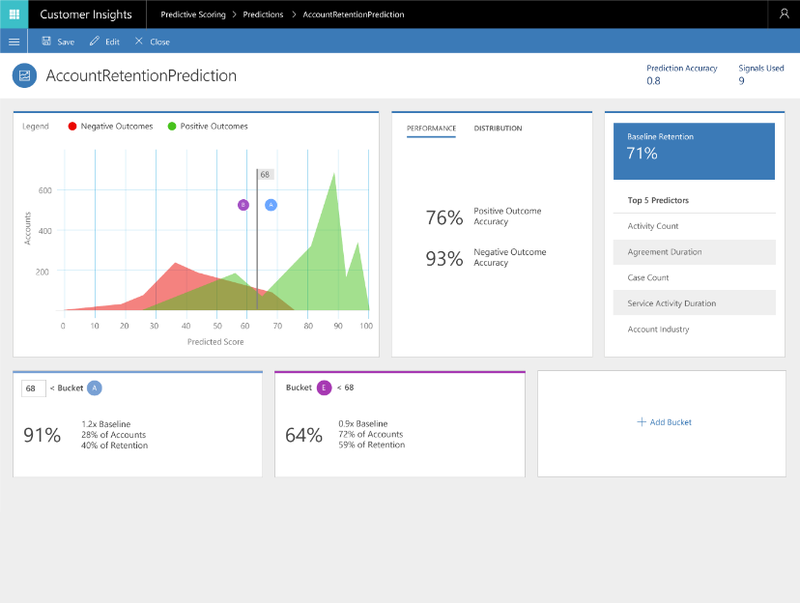 I’m particularly excited about the Predictive Scoring application we introduced, which enables business users of all skills to predict any business outcome that matters to them. You can use Predictive Scoring to predict accounts that may churn, opportunities at risk, leads likely to qualify, cases that may escalate, agreements that will renew, user preferences that may change, and more. This short video provides a quick look. In Customer Insights, you can create predictions by simply identifying the desired entity and attribute values which represent the outcome you want to predict. For instance, if you want to identify the accounts that may churn, all you have to do is identify the Account record and its status attribute and values which represent the accounts that have churned and those you’ve retained. Customer Insights automatically uses this as labeling information to discover all available historical account information. It explores the data connections for your accounts, to identify the related signals and assesses them for predictive influence. With automatic feature extraction, it selects the key features from the available data. It splits your historical data set into training and validation data, builds a Machine Learning model, and trains and validates the model for your use. With an intuitive experience, Customer Insights shows you how effectively the prediction separates the positive and negative outcomes. You can then customize the grading of open records based on their propensity to achieve the desired outcome. The process of grading simplifies integration of predictions into your business process, so you can plan follow-ups efficiently based on the predicted grade. When you apply the Predictions, all open records are continuously rescored, with the most recent predictions accessible to your team. Customer Insights also identifies the top predictive factors which positively or negatively influence the prediction score and grade for a given record. With prediction insights, you have full visibility into the effectiveness and performance of your predictions over time. With Customer Insights, applying Machine Learning is automated and simplified, to be accessible to organizations of all skills. Read more here. 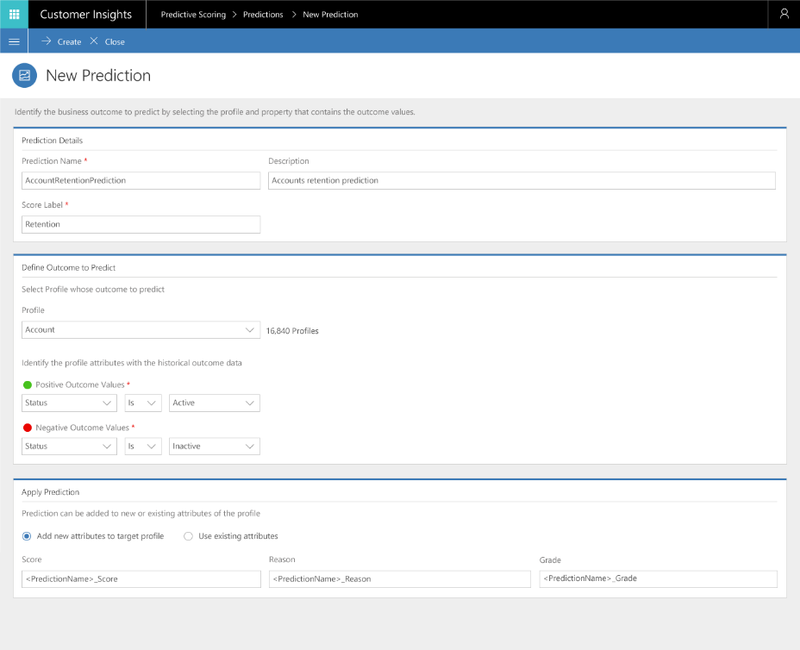 You can try the new Predictive Scoring as part of the Customer Insights Preview – signup through the Azure Portal, and let us know your feedback.